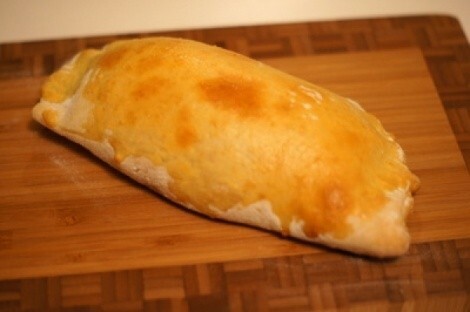 If you've never had a calzone before, you're in for a treat! If you have, you know that a calzone is a half-moon-shaped turnover with stuffing common to pizzas -- sort of an inside-out pizza. --- Calzone stuffings can be as varied as your imagination. Here, I'm offering a recipe using cheeses, ham and chicken as the main stuffing ingredients. But, you could use cooked sausage, pepperoni, spinach, mushrooms or just about anything else that you might put on a pizza. Usually when I'm making calzones, I tend to use whatever I have in the fridge. Leftover deli meats and cheeses and such can make excellent calzone stuffing. 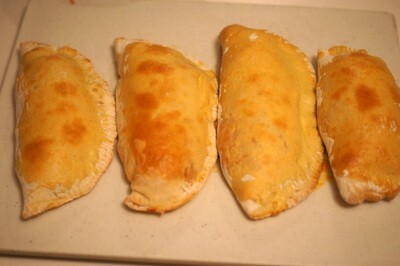 Also, many calzones are made without tomato sauce, the sauce being served on the side for dipping. 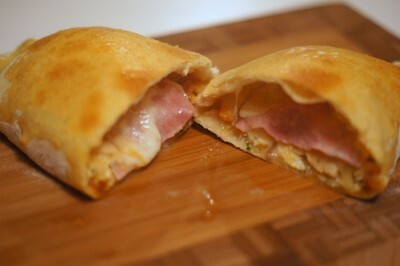 Suit yourself; sauce-free calzones are delicious, too. 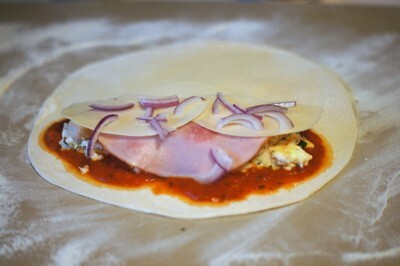 It's also useful when making pizza and calzones to have a pizza stone or cooking tiles in your oven. 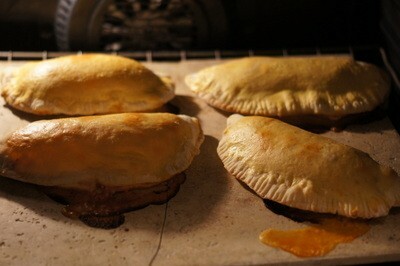 If not, you can cook the calzones on a baking sheet lined with parchment paper. 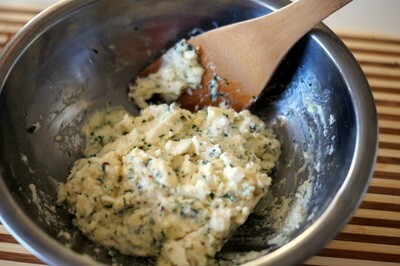 In a large bowl, mix together the mozzarella, ricotta and Romano cheeses, along with 1 egg, the parsley, oregano, chili flakes, salt and pepper to taste. Set aside. 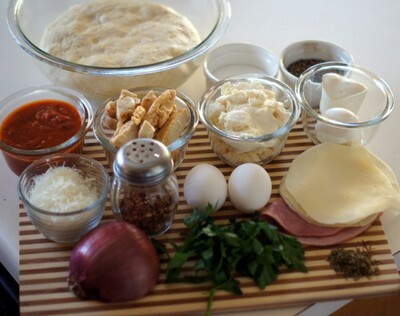 Divide the pizza dough into 4 pieces and shape into balls. Don't worry if they're not perfectly round; mine never are. 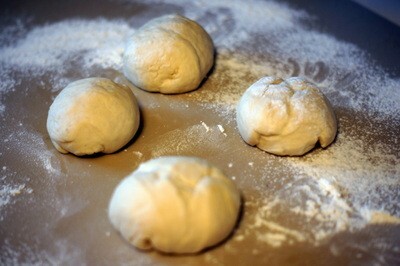 On a lightly floured surface, roll one of the pizza-dough balls out into an 8-9-inch circle. Again, don't worry if it's not an absolutely perfect circle. 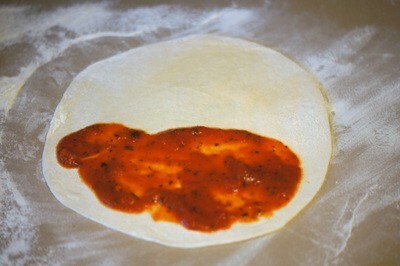 Spread some of the pizza sauce or marinara onto one-half of the dough, leaving a half-inch or so border. Onto the sauce, place a layer of the cheese and egg mixture, followed by a slice of ham, a few strips of chicken, a slice of Provolone, and some sliced onion. Have a small bowl of water standing by. Using your finger, dab some water around the entire edge of the dough. 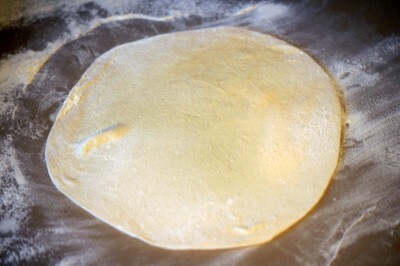 Then, fold the dough over to make a half-moon shape. 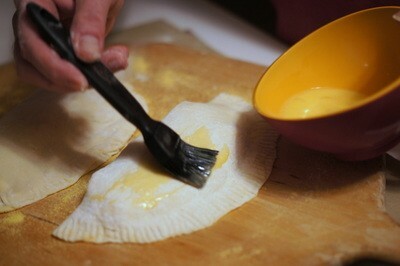 Use a fork to crimp the edges. Repeat with the other calzones and carefully place them on a pizza paddle (if you have one), dusted with corneal, which will help them to slide easily onto the baking stone or a baking sheet lined with parchment paper. 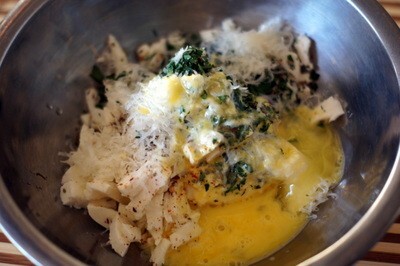 In a small bowl, beat the remaining egg with 1 Tbs. 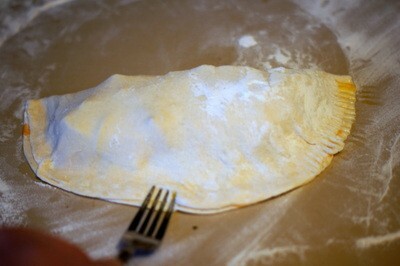 water to make an egg wash. Brush some of the egg wash over the tops of each calzone. 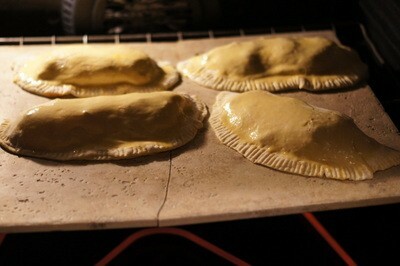 Place the calzones in the oven and cook for approximately 20-25 minutes, until crisp and golden. Some of the cheese might ooze out -- who cares? 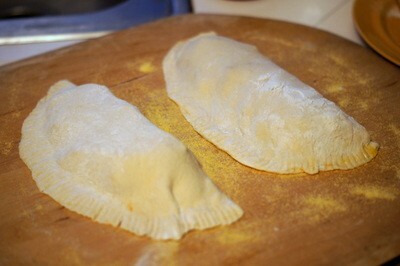 Remove the calzones from the oven and allow to cool for a few minutes. Serve with a good green salad and (optional) more marinara sauce on the side for dipping.